In the tradition of Mickey Spillane, Greg Rucka creates stories of suspense and danger set in a dark and violent world. 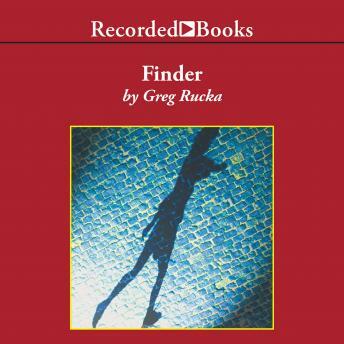 Like Keeper , his first Atticus Kodiac novel, Rucka keeps the pace and the surprises in Finder coming at breakneck speed. During his last job as bodyguard, Atticus lost his best friend. Now, as bouncer in a rough New York nightclub called The Strap, trouble has found him again. At the bar, Atticus sees the 15-year-old daughter of a ruthless Colonel he guarded in the Army. Soon, Atticus is hired by the Colonel to protect his daughter from an ex-wife. Atticus discovers, however, that he has really been pitted against rogue assassins. And the stakes are much higher than the daughter's life. Through bursts of gunfire and brutal ambushes, Atticus struggles to keep his promise to protect the girl. George Wilson's agile narration propels the listener toward Finder's explosive conclusion.